Last month on this page I reported on Lloyd Green's involvement in the new recording of "Songs of Fox Hollow". I'm pleased to follow up with this report of the CD's imminent release and concert. On Wednesday evening at the Country Music Hall of Fame in Nashville, Lloyd will take the stage to back vocalists Bobby Bare, Patty Griffin, Buddy Miller, Tommy Cash, Jim Lauderdale, Peter Cooper, Eric Brace & Last Train Home, Gary Bennett, Jon Byrd, Mark & Mike, The Wrights, Fayssoux Starling McLean. 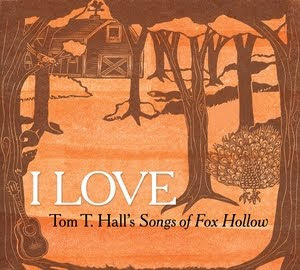 Songwriter Tom T. Hall will also perform. Of special interest to guitarists, Duane Eddy will be performing his trademark style with Buddy Miller on the hit song "Sneaky Snake". In addition to Lloyd Green on pedal steel, the band will include Jen Gunderman on keyboards, Mike Bub on bass and Mark Horn on drums. These are the same musicians who played the sessions. The May 25th concert starts at 7 PM, and video will be streamed live on the Internet at the CountryMusicHallOfFame.org web site for those who can't attend in person. There's also a very long article about the project at that site. I've heard the CD and in addition to the excellent steel playing it's one of the best recordings I've heard in recent years. This promises to be the landmark concert of the year for lovers of real country music. The CD, which was produce by Peter Cooper and Eric Brace, is now available for purchase at RedBeetRecords.com. The concert did not disappoint! Very nice indeed.